The Armoury Chamber of the Moscow Kremlin is a world-famous Royal Treasure House and one of the oldest museums in Russia. The Armoury's Collection was formed gradually over several centuries. The main collection consists of treaures from the Kremlin repositories: ancient state regalia, carriages, horse equipment, foreign orders, gold-and-silverware, weapons, ceremonial dresses, mediaeval Russian embroidery and other works of art. 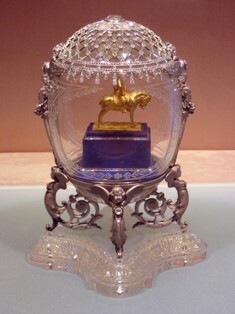 And one of the main gems in the Kremlin Armoury Museum is a unique collection of Faberge Eggs. It demonstrates the brilliant flowering of Russian jewellery-making and other forms of decorative applied art. The Faberge firm was founded by Gustav Faberge in St. Petersburg in 1842.The company got its worldwide recognition under his son Carl. 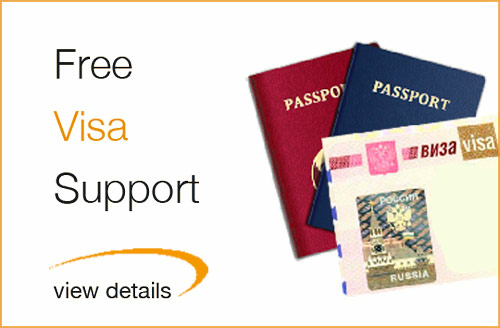 The firm grew fast and accounted about about 500 people, including its most talented and famous master Mikhail Perkhin. Mostly all the Faberge presents were made at Perkhin's workshop. The jewellers made earrings, brooches, opera glasses, snuffboxes, powder-cases. Their items show great technical skill and artistic originality. 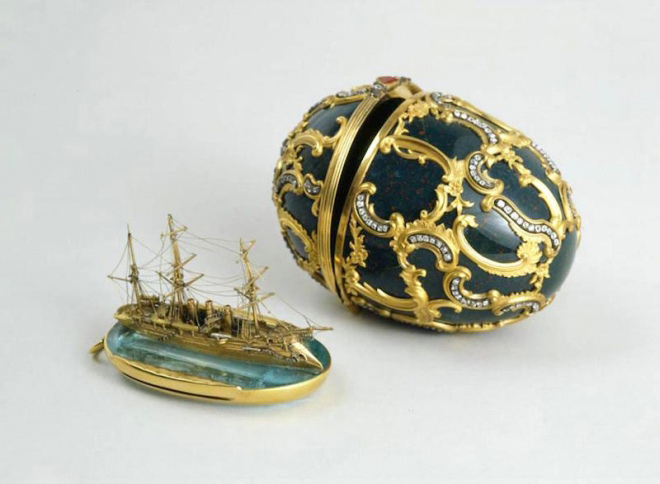 Among them, a special place is occupied by Carl Faberge’s souvenirs in the shape of Easter eggs with a surprise inside. 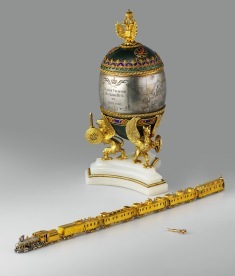 For 11 years Carl Faberge was commissioned to make Easter eggs for the Royal Family. And only in the Kremlin Armoury Museum you will have a chance to see the finest and best known part of the Faberge heritage – the Imperial Faberge Eggs. Egg with a model of the 'Memory of the Azov' Cruiser. It was a present from Emperor Alexander III to Empress Maria Fyodorovna. The heliotrope egg consists of two parts. The dark green heliotrope is decorated with diamond-studded gold scrolls. Clock Egg. Another fascinating item by Perkhin which you can see in the Armoury is an egg in the shape of a clock - Clock Egg. It was a present of Emperor Nicholas II to his wife Empress Alexandra. This egg is remarkable for its elegance and technical perfection. On the top you'll see a bouquet of white lilies made of chalcedony and gold. Trans-Seberian Express Egg. Perkhin created a gold model of the first train to run along the Trans-Siberian Railway. It's very interesting that carriages are made of pure gold and each has an inscription: "Ladies only", "Gentlemen only", "Mail car" and "Church car". 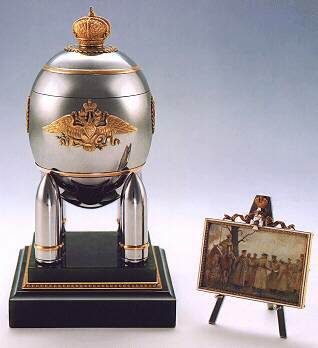 This egg was also a present of Nicholas II to his wife. Moscow Kremlin Egg. A present from Empreror Nicholas II to Empress Alexandra. 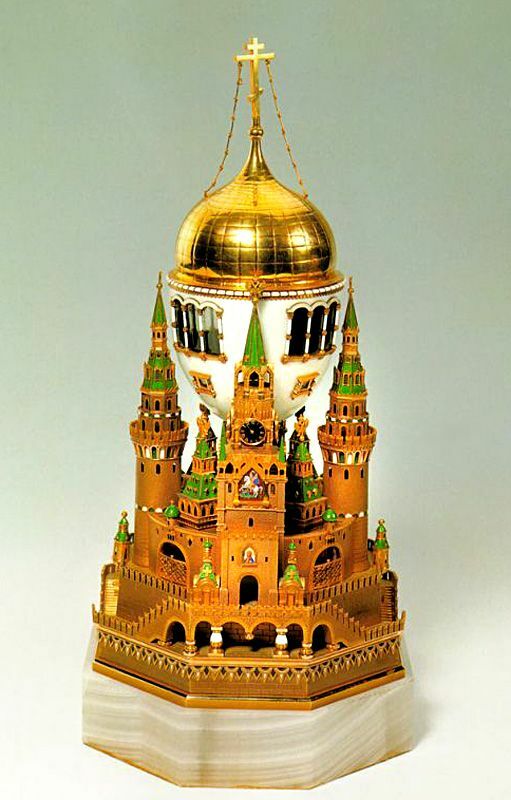 This Imperial Faberge egg is a stylised model of the Moscow Kremlin and made of coloured gold and silver. It is a music box. In the center is the dome of the Assumption Cathedral which is located in the Moscow Kremlin in the center of the Cathedral Square. If you look through one of the windows in the church you'll see the iconostasis and icons of the Assumption Cathedral. 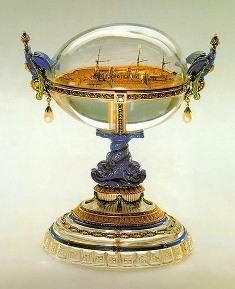 Alexandrovsky Palace Egg. The Easter Egg is decorated with five miniature portraits of Nicholas II children in diamond frames. The model of Alexandrovsky Palace is made of gold and silver with windows of rock crystal. The egg was also a present of the Emperor to his wife. Standart Yacht Egg. It was a present for Easter of the Emperor to his wife Alexandra. 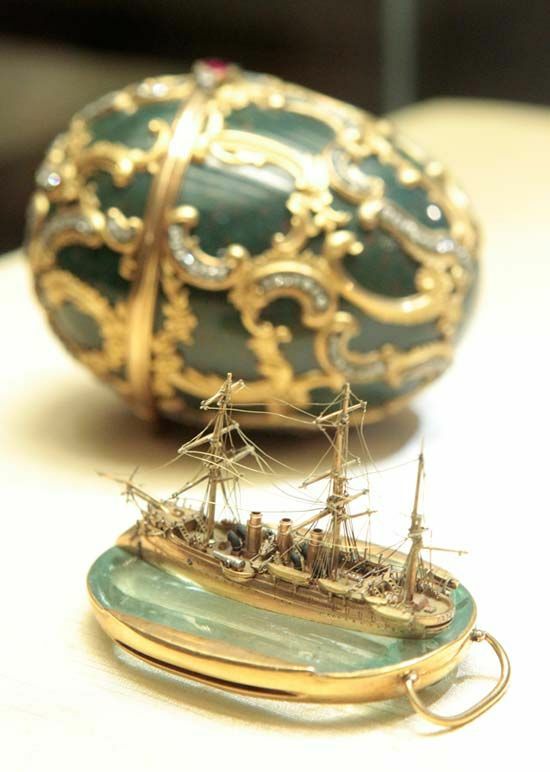 The Egg represents a gold model of the royal yacht "The Standart" which belonged to the tsar's family. The gold setting is decorated with diamonds, enamel and two lapis-lazuli figures of heraldic double-headed eagles. Alexander III Monument Egg. 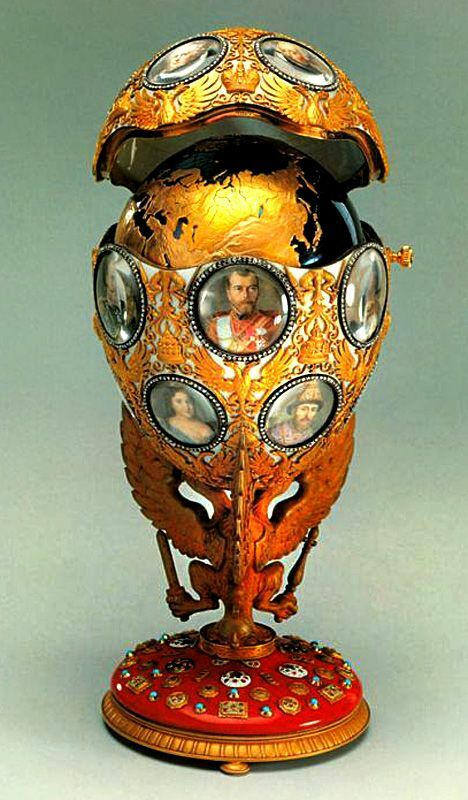 It was a present of Empreror Nicholas II to his mother Empress Maria for Easter. The egg is made of rock crystal and divided into two parts. A gold model of the monument to Alexander III fits inside the egg. The model is a copy of the monument by sculptor Trubetskoy that is in St. Petersburg. Steel Egg with Miniature Easel. It was also a present for Easter of Nicholas II to his wife. The egg is decorated with the gold Imperial Crown. In the middle of the steel egg you'll find the symbol of Russian Empire double-headed eagle. The miniature on the easel shows meeting Russian troops with Empreror Nicholas and his son. Clover Egg. A present from the Empreror to his wife. The open-work egg made of gold filigree leaves of clover, some of them filled with light-green transparent vitreous enamel and some of them filled with true pretty diamonds. 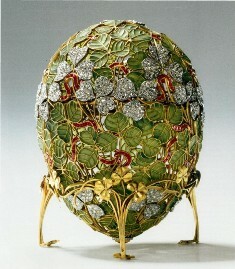 This egg was symbol of a happy marriage of Empreror and his wife Alexandra, the symbol of union of two loving hearts. 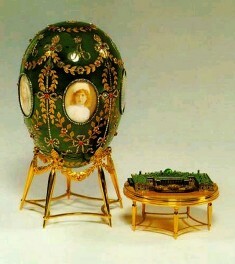 Romanov Tercentenary Egg. Another beautiful example is the Easter egg in commemoration of the tercentenary of the Romanov dynasty. And of course the egg is decorated with 18 portraits of representatives of the Romanov dynasty. Welcome to the Armoury Chamber – the Treasure House of the Moscow Kremlin and repository of the unique collection! 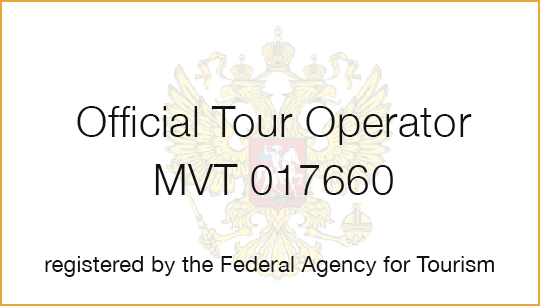 We invite you to enjoy this great and vast collection on our guided Kremlin Tours. 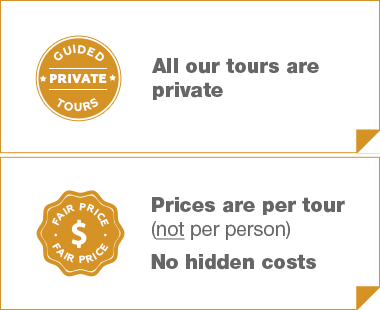 We will ensure you will see all of its masterpieces, and the time will fly quickly – so enjoyble it is on a tour with us!